A two-year amateur investigation to locate the exact place where the poet William Blake was buried resulted in a grand unveiling of a new crowd-funded headstone recently. 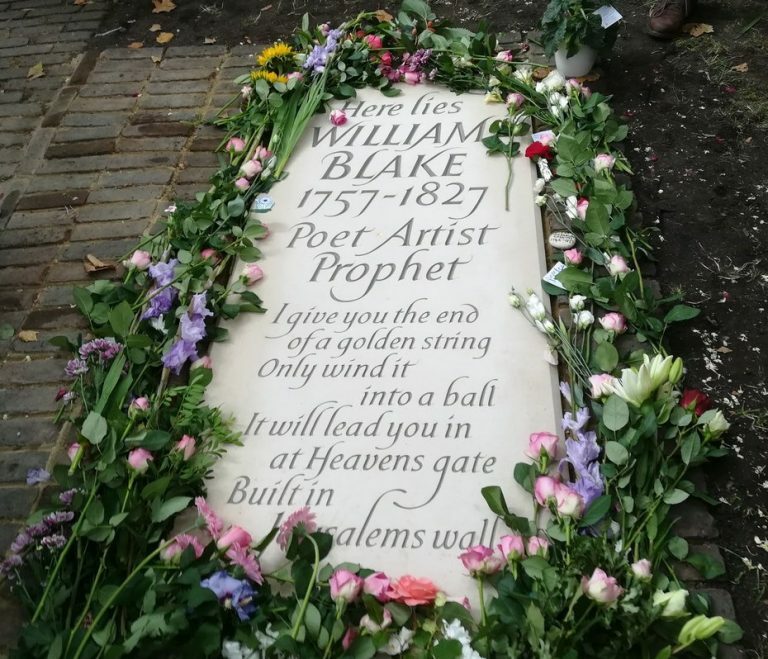 When Carol and Luis Garrido, huge fans of Blake’s art and poetry, came to visit his grave in Bunhill Fields, London in 2004, they were disappointed only to find a stone saying that his remains lay “near by”, due to confusion caused by WW2 bomb damage to the cemetery. They determined to pinpoint the exact spot, using original co-ordinates, which they achieved in 2006. After this The Blake Society began a crowdfunding appeal to provide a more accurate marker, and on 12 August – the anniversary of Blake’s death – a new headstone, carved by Lida Cardozo, was unveiled watched by a crowd of several hundred.